While the timing of this price drop is likely coincidental considering the reports in recent days regarding the lackluster sales of the Garminfone T-Mobile has dropped the price to $129.99. The real question is will this do anything to boost sales of the Garminfone or is it to little to late? With the Samsung Vibrant on the horizon and with yesterdays rumored leak of the T-Mobile 2H 2010 roadmap the Garminfone looks to be outclassed and outgunned. Still, if navigation is your number 1 priority, you need not look any further. Sorry, but my Slide does everything this phone does, plus more (physical keyboard plus a faster processor and more memory!). Thank you, free Google Navigation. Actually this phone does stuff the MT3GS does not…………Just throwing this one out here Navigation with out a f&^king data connection…….which comes in handy if ya lost and not have cell service………. how much was the phone before? This phone should have been $129.99 to being with. T-Mobile needs to quit selling their smartphones at a 2-yr discounted price of $199.99. I never thought this phone should have been $199 to begin with. It should have started at $129.99, if you ask me IMHO. It surely cannot even compete with the Vibrant to have started out at the same discounted price IMHO. Get it right T-Mobile. This should be $99 not $129. Plus, alot of folks hate that MIR thingy. 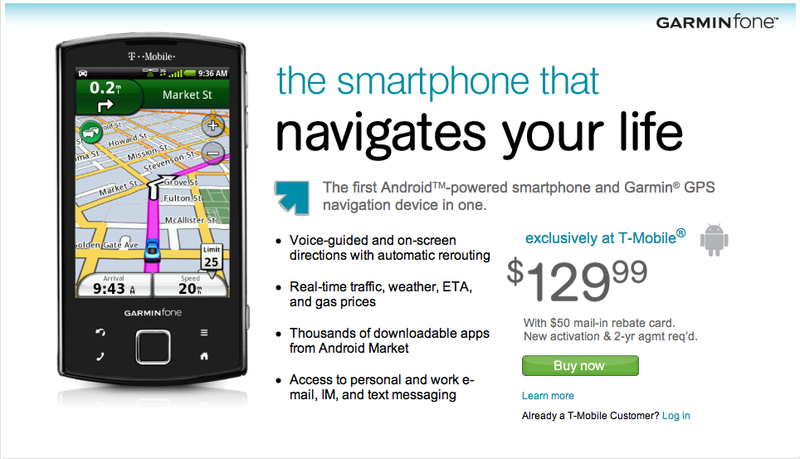 Garmin should sell an app with all their maps on the android market. :) And make all android phones navigational without having a data connection. They did with Windows Mobile 6 & paired it with a bluetooth GPS receiver. I used it with my dash for years. The problem is that you have to pay them to upgrade your maps. I could even use the bluetooth GPS with Google Maps – it worked great… Wish it would pair with my G1 the assisted gps is garbage. Was out on my boat in fog and freakin phone told me I was in Russia.. It would have been okay if I had that red headed spy with me though..
Upgrade pricing is $150 with a $50 rebate down to $100 after MIR. So cheaper for existing customers. For 70 extra bucks you could have the newest iPhone. I am typing on one now and it really is nice. You are typing on it now. Later the phone will set fire and kill your family while you sleep. Good choice of a phone. (With how many issues are arising with the new iPhones, who would want one)? I wouldn’t pay an extra $70 for that. oh come on this should be at least 129 off contract at the least. Liked this phone when I test drove it. 2 Things made me drop it. Headphones had to have adapter and no clear android upgrade path. Still think its the best looking android in tmobile lineup but bad choice on no 3.5 jack and ironclad promise for 2.1 or 2.2 android. Regardless of all that it is selling well as for I saw quite a few people who have purchased one. The. $129 price point will increase it’s sales more of course, but overall if you see a lot of people with one to their ear then that means the masses love it.